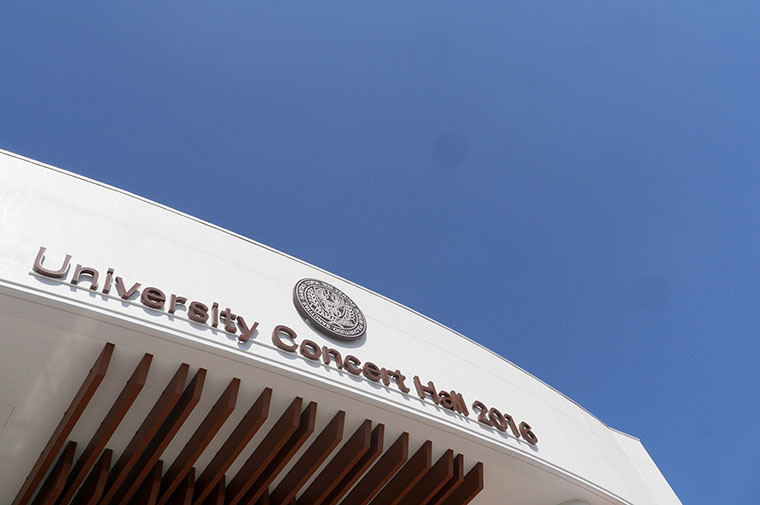 Students in 11th grade gathered in the University Concert Hall for a Global Career lecture while the spring weather was beautiful. 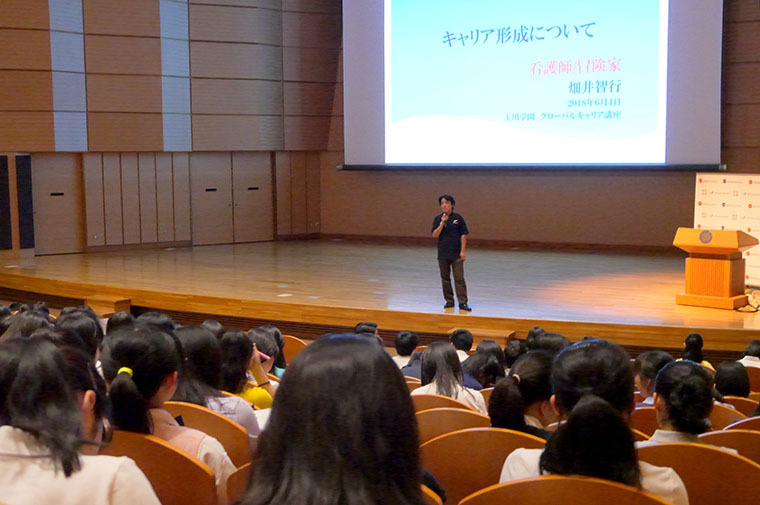 The lecture theme for Eleventh graders, whose “course” has become a familiar concern, was “Career formation”. 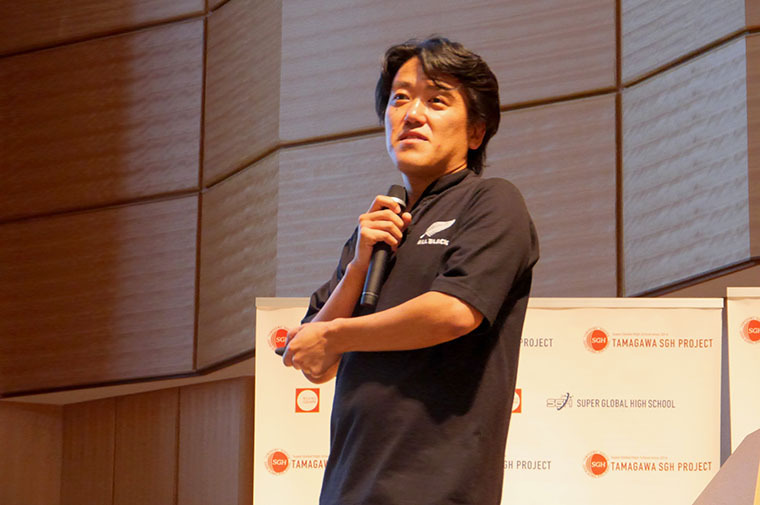 Tomoyuki Hatai, who participated in Doctors Without Borders and has been active in emergency missions around the world, told them about what is important in building a career, through his own experience. 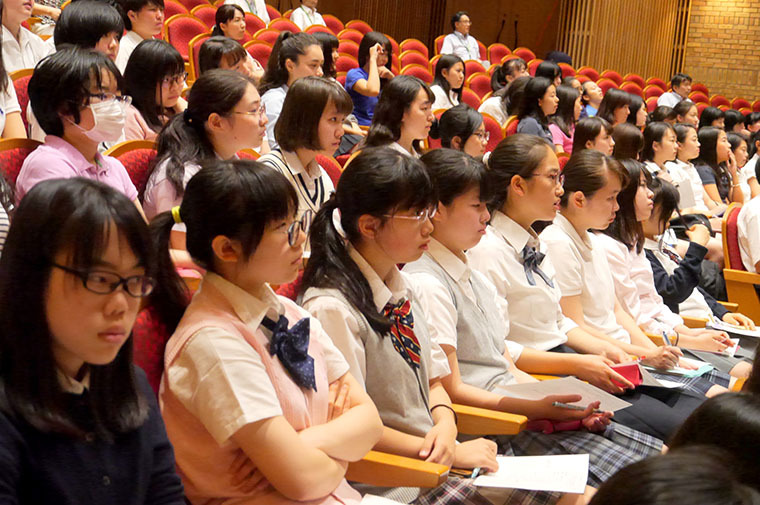 At the beginning of the lecture, the atmosphere in the venue was built by the booming voice of Mr. Hatai and the students straightened up to listen. “Do you know Doctors Without Borders? What is the organization doing? ” ” How many liters of water are you using a day? How many liters of water are necessary for people to live?” were questions he asked them. First of all, he introduced the activities of Doctors Without Borders and the circumstances of the countries the organization is dispatched to, while showing the local images and asking questions. 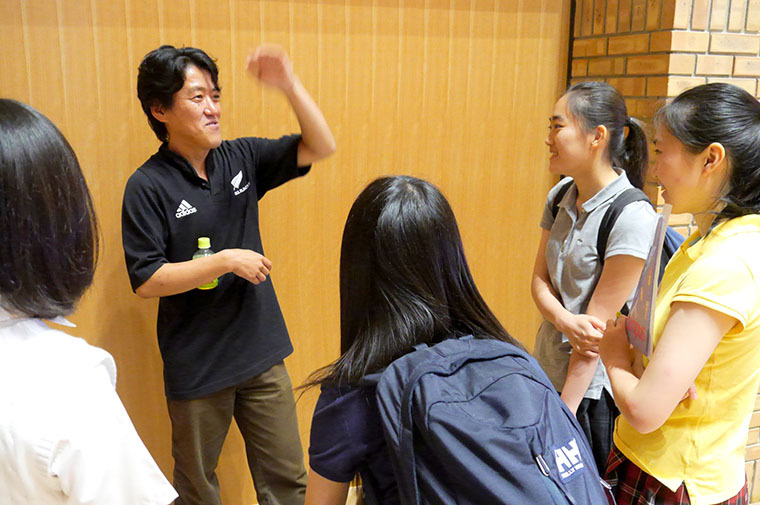 In addition, Mr. Hatai walked around the hall and sometimes talked with the students in their seats. 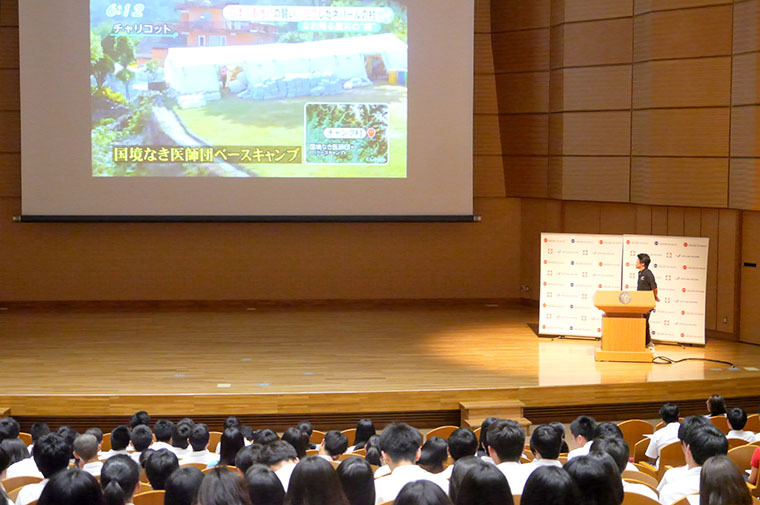 The students felt his ability to communicate and take action, which was cultivated through numerous overseas experiences, such as emergency on-site trips. 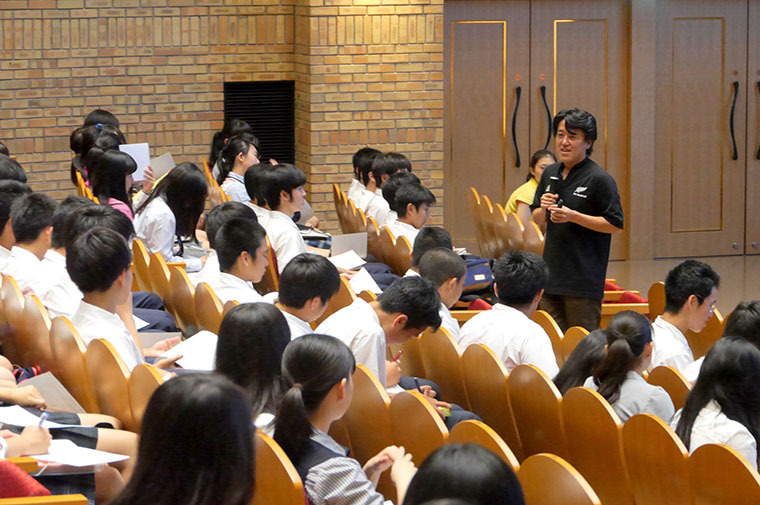 When he was a high school student, he became interested in the world outside of Japan. That was an era when waves of major changes were coming around the world, like “The collapse of the Wall of Berlin”. 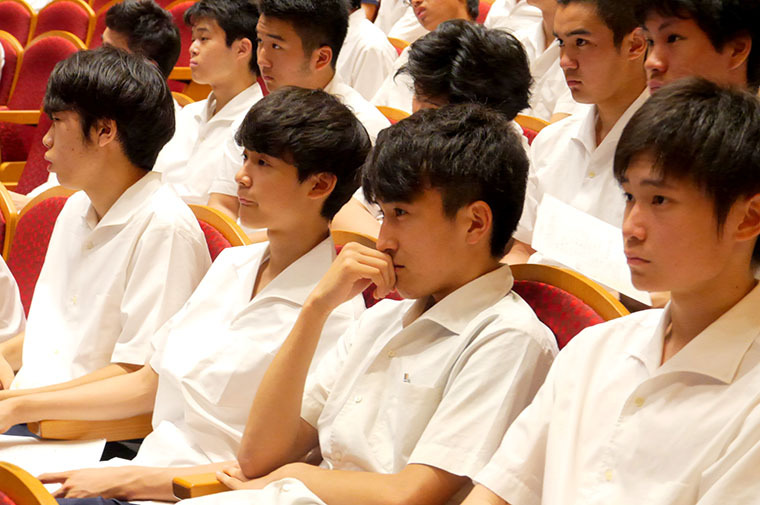 Although Mr. Hatai had decided to go to university, he didn’t know what he wanted to do. While watching overseas news on TV, he started to have a strong desire to see the world with his own eyes. And after graduating from high school, he dared to venture out overseas. Backpacking for 4 years, he worked for NGOs in Europe and Asia. In 2001, he reached a turning point. He learned about the “Western Indian Earthquake” with the loss of 20,000 lives and 166,000 injured in India. 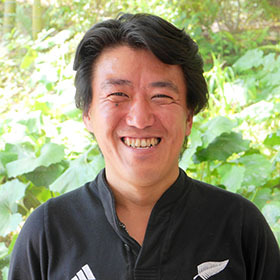 When he realized he didn’t know how to help people in need, he thought “I want to work to save someone’s life rather than volunteer to survive and wander.” Then Mr. Hatai decided to go back to work and returned to Japan. He worked as a nurse for eight years and gained experience. He reflected on his experiences working at the forefront of this emergency medical care. He felt ” It’s time to go overseas now ” and decided to participate in Doctors Without Borders. Since that time, he has carried out emergency mission activities in more than 10 times. 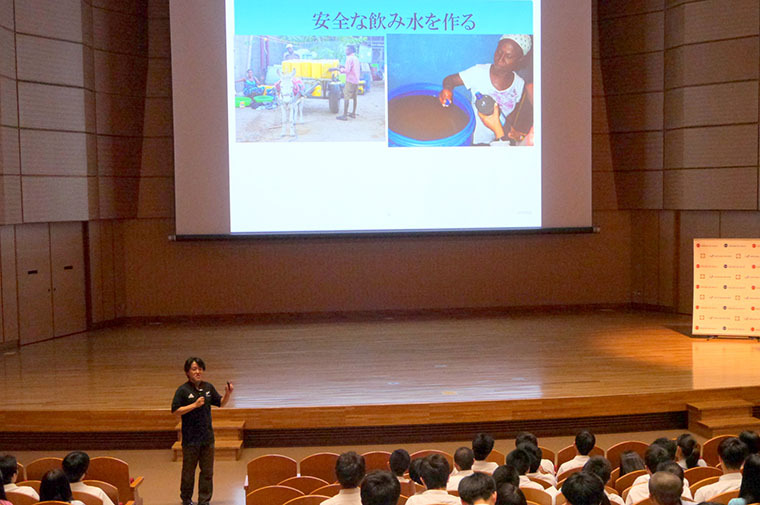 He started in South Sudan in 2013 and visited other areas such as Nepal and Kumamoto where major earthquakes occurred. He has also visited conflict areas in the Middle East and refugee camps throughout Africa. 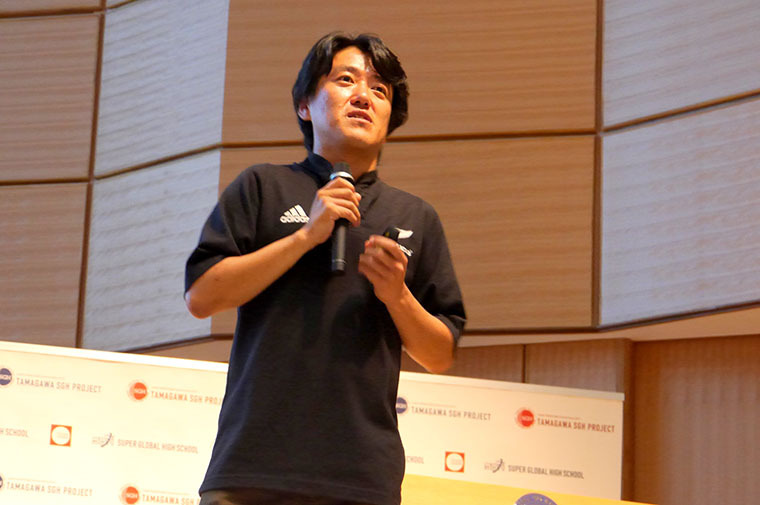 Currently, he is involved in the “Ship for World Youth program” which carries out multilateral exchanges onboard a ship, the “Pura Vida Japan”, which supports people with visual impairment. While expanding the scope of his activities in situations like that he continues to search for new experiences. 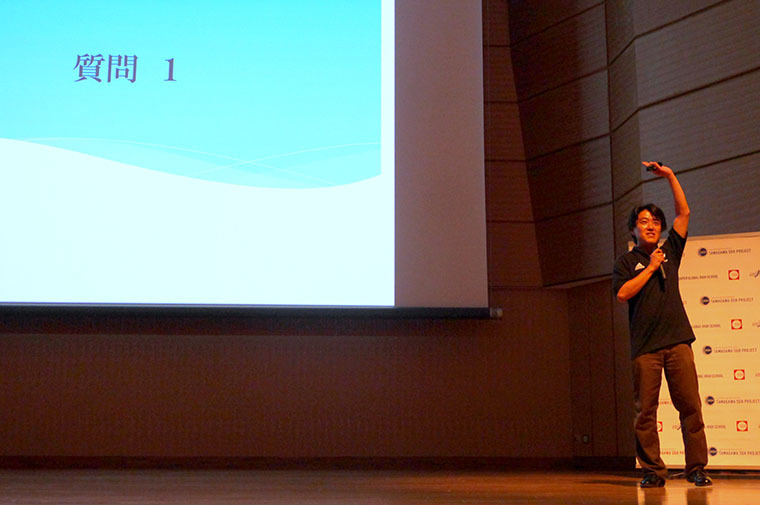 Mr. Hatai’s powerful message carried considerable weight he has recounted his own experiences. His words stayed firmly in the students’ minds. 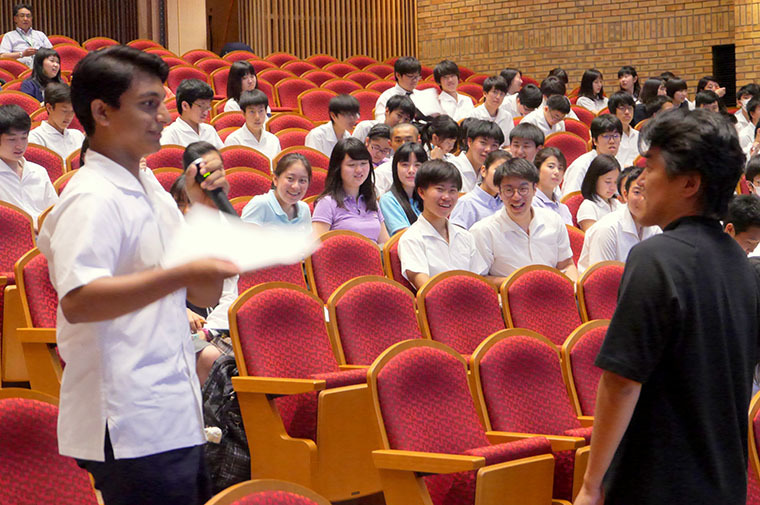 The refreshing smile of Mr. Hatai was reflected in the faces of the students. He demonstrated his communication skills on the global stage and showed a strong commitment to saving people in harsh environments and overcame a lot of challenges. The students’ minds were opened by seeing an attitude like his. They were motivated to experience the world according to their own feelings. 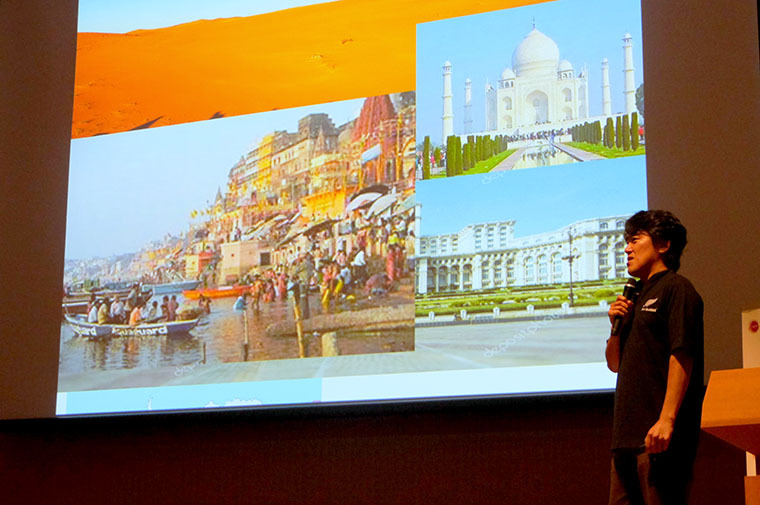 After graduating from high school, he worked in NGOs in Europe and Asia backpacking for 4 years, and then aspired to become a nurse as a result of the 2001 Indian earthquake. As a nurse for eight years, he worked in the Red Cross Hospital ICU and on a remote island in Okinawa. 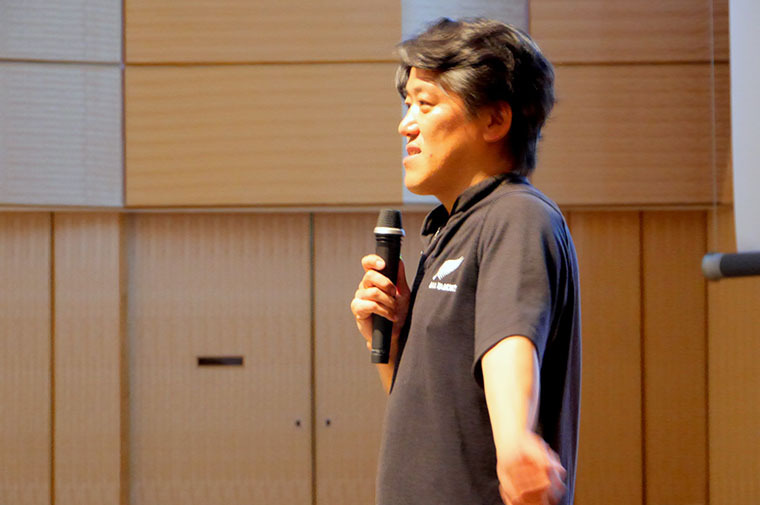 He participated as a ‘DMAT’ during the period after the Great East Japan Earthquake. In 2013 he joined Doctors Without Borders. He has been deployed 13 times mainly on emergency missions such helping with the Ebola crisis, the Nepal earthquake, Kumamoto earthquake, conflict sites in the Middle East, and assisted refugees in various parts of Africa who were suffering from malnutrition. Currently, he also works in the ‘Ship for World Youth’ program of the Cabinet Office.